Startup Europe Week has been created to include all the European regions in a startup focused program. Many global initiatives have been created to celebrate entrepreneurship. Typically, such events follow the Silicon Valley format (keynote motivational speeches, networking sessions etc). But Europe is different and requires something more when it comes to starting a business. Regional diversity and local policy making play a big role in shaping European startups. European regions are key players, from helping entrepreneurs to incorporate a company, to providing grants or taxes breaks. 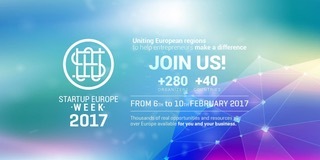 The Startup Europe Week (SEW), was held for the first time in 2016 simultaneously in different cities in the EU under the auspices of the European Commission and the Startup Europe network. SEW focuses on highlighting best practices and regional policies that shape the business environment in Europe. This year, the SEW2017 (6-10/2/2017) is expected to exceed the 280 events across EU to hundreds of cities in Europe! On Friday February 10th in Thessaloniki, the Co-Organizers with the support and at the premises of CITY College, Sheffield University International Faculty will host the SEW main event. The event will feature 3 panels, Q&A sessions and networking drinks. The topics of the event focus on the stage before starting a start-up: the strategy, the preparation, the decision as well as the best practices and the financial tools available from local and European, public and private resources.